Baileys Irish Cream has provided us with a modern retelling of Tchaikovsky’s traditional ballet, ‘The Nutcracker’. The two minute film, set in Candyland night club, brings three women into a Christmas party where Clara, the lead, catches the eyes of both the Nutcracker Prince and the Mouse King. The atmosphere darkens, and so begins a thrilling dance sequence as the men fight over Clara. The excitement builds to a spectacular crescendo, but after coming to the rescue of the ‘Nutcracker Prince’, Clara rejoins her group of girlfriends to continue partying the night away. 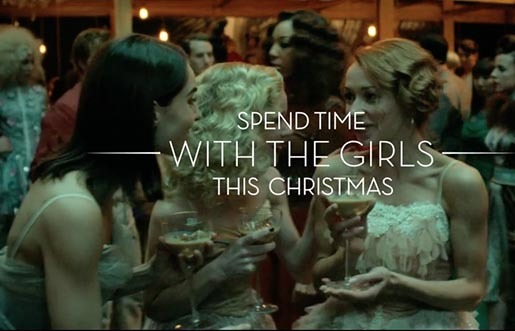 The film ends with the line ‘Spend time with the girls this Christmas’. The Nutcracker campaign was developed at BBH London by creative team Ed Cole and Lewis Mooney, deputy executive creative director David Kolbusz, producer Victoria Baldacchino, strategic business lead Richard Lawson, commercial strategy director Heather Alderson, strategist Sarah Rabia, account team director Rachel Parry, account team manager Lucy Nebel, working with Garbhan O’Bric, Global Brand Director and Chin Ru, Global Strategy and Communications Manager. Media planning and buying for the campaign was handled by Carat. Filming was shot by director Ringan Ledwidge via Rattling Stick with producer Sally Humphries, production manager Lucy Booth, production designer Sarah Greenwood, director of photography Ben Seresin. Editor was Richard Orrick at Work Post with assistant editor Charlie Morton. Post production was done at The Mill, London, by VFX producer Gemma Humphries, shoot supervisor Dan Adams, 2D lead artists Barnsley, matte painter Can Y. Sanalan and colourist Mick Vincent. Sound was produced at Wave Studios by sound engineer Aaron Reynolds. The film stars Royal Ballet principal dancers Steven McRae (The Nutcracker Prince) and Thiago Soares (The Mouse King), and Royal Ballet guest principal Iana Salenko (Clara), guest principal with The Royal Ballet. Dance routines were choreographed by Benjamin Millepied, the world-renowned dancer and choreographer behind Black Swan, and the incoming director of the Paris Opera Ballet. Wardrobe was styled by costume designer Rosa Dias. See the Baileys Behind The Scenes video. The Making-of film was directed and edited by Jack Whiteley with producers Ellie Fry and Charlie Lodder, director of photography Christopher Du’mont.